The perfect wrapper design for today's bride. Our BROWN & BLUE DAMASK CANDY WRAPPER will add style and sophistication to any Bridal Shower. Wrapped around a yummy chocolate bar for the SWEETEST favor and is sure to be a hit at your party! Order the fully WRAPPED CANDY BARS. We will do the work for you! 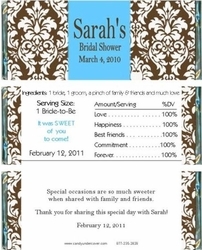 Your Bridal Shower Candy Bar Favors will arrive to you all ready to pass out to your guests.